Yesterday I noticed the skies were full of migrating snow geese. Today, I grabbed my camera and went to find them, as well as a few beautifully colored ducks passing through. See all the pictures and help identify everything! I drove Missouri Highway 79 from Clarksville to Elsberry and found a few thousand snow geese in a field off 79 & Old Dameron Rd (gravel). I pulled in just before the noise of a nearby train flushed 1000 birds into the air. From the first frames I could tell it was going to be a good day for pictures. I continued on Old Dameron and looped back around toward Elsberry where I got great close-ups of Mallard and Pintail. Then I headed north on Hwy 79 to Annada, Missouri and the Clarence Cannon National Wildlife Refuge. I stopped at the visitor center to get the latest migratory info from the local rangers. Just by driving through the refuge, I was able to capture the great pictures of 100’s of ducks bursting from the managed fields. There were many different types of duck in the sky, and I even captured an eagle in their midst. It was a great experience to see so many birds in the area. You can experience the same thing by making a day trip to your local wildlife refuge. The 3,750-acre Clarence Cannon National Wildlife Refuge is located in the floodplain of the Mississippi River, adjacent to Pool No. 25. The refuge’s diversity of habitats supports waterfowl, wading birds, shorebirds, and songbirds. Although it is protected by a levee, the refuge provides flood storage in periods of high water. Clarence Cannon Refuge is managed by Great River National Wildlife Refuge. From St. Louis, take I-70 west to the Highway 79 exit. Take Highway 79 north approximately 35 miles to the town of Annada. In Annada, take County Road 206 east one mile to the refuge office. Pelicans and eagles are both roaming the skies today in Clarksville. Before I took my shift at the visitor center, I took a few pictures. And I’ve had a few visitors stop by. A few friends and a few strangers. We all agree it’s been a great day to be out in Clarksville. If you were in Clarksville this week, you couldn’t miss the number of pelicans flying around the riverfront. I had my camera with me, so I took a few photos. You can also spot bald eagles in the trees and air. The pelicans floated south with the current until they were too far from the churning waters caused by the Lock & Dam. Then they would fly up to get close to the dam, and repeat. They were also grouped on the sandbar across the river. The World Bird Sanctuary of St Louis put on an great live eagle presentation in the Apple Shed. They brought 2 eagles: Duncan, an Australian Wedge-Tailed Eagle; and McGuire, a Northern Bald Eagle; and presented a 30 minute show every hour. I can’t express how cool the show is. If you haven’t been, you must put it on your list for next year. We’d also like to thank the MO Department of Conservation. MDC organizes Eagle Days and provides field scopes, bonfires, films, brochures and personnel for a full weekend of outdoor learning and fun. We’re glad they come to town, and thank them for helping to make all our visitors feel welcome. Don’t let this weather keep you inside. 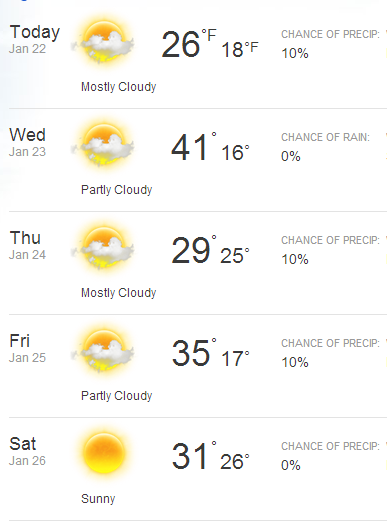 I would love to see it COLD all week! With the freezing cold, comes better eagle viewing in Clarksville, Missouri. Take a look at the eagles I caught last week when there was just enough ice on the Mississippi River to let them land and eat their catch without flying back to their tree. 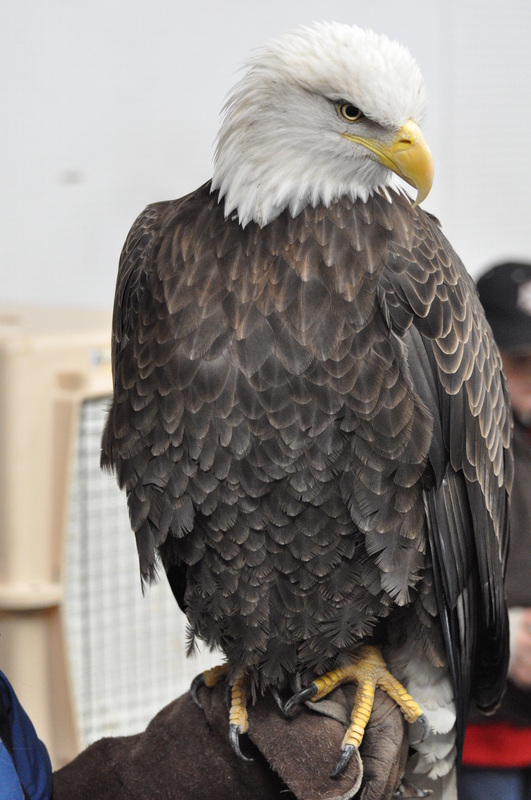 Remember, this weekend, January 26th-27th 2013 is Eagle Days, where the World Bird Sanctuary will be making eagle presentations every hour Saturday & Sunday. They usually bring 2 different types of eagles. One bald eagle, and another eagle species to compare and contrast. Last year they brought a tawny eagle. Held in the unheated Clarksville Appleshed, you’ll need to wear your coat, but it’s well wort the trip. Just this weekend, January 19 & 20, we had a great weekend of eagle activity with over 40 eagles flying around Clarksville. But if you want to really see an eagle, you should not miss Eagle Days. 10 Eagles. Adults and Juveniles. I’ve only seen 3-4 flying. You need patience and good binoculars! It’s been a few weeks now but a good old fashion cold spell has kept it around. Maybe it’ll bring a few eagles down from the north.